That's right, Beavers Bend Sate Park has an annual art show. This year will be the 40th annual Owa-Chito Art Show and will showcase artists from Arkansas, Louisiana, Texas, and Oklahoma. Mediums range from Wood to watercolor, with professional,non-professional, and student categories. June 7th is the opening reception with awards being presented on June 17th. 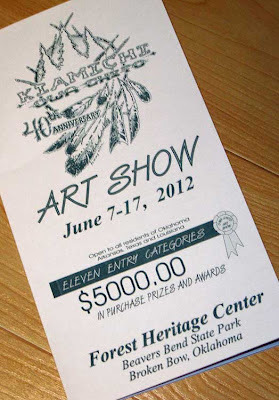 If you are an artist, you can get an entry form by contacting the Forest Heritage Center at 580-494-6497. June 1, 2012 is the early entry deadline. This year there are 11 entry categories with $5000.00 in purchase prizes and awards. Find out more information on the Kiamichi Owa Chito Art show here.